The cooler weather and grayer skies were good for backgammon turnout – we had 8 people for our second attempt at meeting at Bushwacker, a perfect bracket. Apologies to Bryan, who showed up mere minutes after I got us started. We’ll get you next time! Martin and Mark F were again matched in the first round, which I swear was random, but if it happens again next time I might re-roll the lineups, because that’s too much good luck for the rest of us. Kevin and Sharon made the trek up again from Coos Bay; and we had one newcomer, Tim, from far off Vancouver (aka my hometown). Michael and Sara rounded out the bracket. Mark F took a picture for later, and graciously sent it to me with some commentary. I’m black in this picture, and leading 3-1 in a 5 point match. 2 away-4 away, and so I know for sure if I double and he takes, the cube is coming back to me on the next move. I had been going for the gammon, but had to leave a blot on the two point, and Mark F rolled a 1, blowing my gammon chances, or so I figured. So, my line of reasoning went I’m still a strong favorite to win the game, if I double he’ll probably drop and I’ll get the Crawford game. What could go wrong? Well, I’m not a strong favorite to win, I’m barely over 50%! GnuBG says the move before (when I had 2 on the two point and 3 on the three point), I was 87% to win and 68.2% to gammon. After the disaster roll of 5-2, I drop to 51.4% to win, 23.8% to gammon! 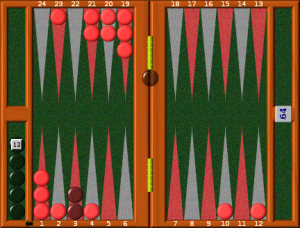 I was right about losing a lot of gammon potential, but the overall win chance was way worse than I was thinking -because what happens next, most likely, is that I’m forced to hit a blot on the one or two point, red hits it again sending a second piece back, and giving red a good chance to win! Easy take for Mark F, and a huge blunder for me! Nevertheless, sometimes the weaker player gets lucky. In this case, after a few enter/hits/rehits, I got a double 5 that brought my back checker from the 23 to the 3. Mark F still had blots on the 1 and 2, and four slots of his home board covered by that point, so most rolls would leave me with a double shot. Imagine my relief when I pulled out a double 6 at that point! Pro tip of the day: during the bear-off, it’s hardly ever wrong to roll doubles. In the consolation bracket, after some initial confusion on my part, Michael held on to take 3rd place. We wrapped up tournament play a bit after 4:30, which was good for me, as I had to pick my wife up at 5:00 – so as far as I was concerned, a perfect tournament!